Hit the hoops and show your support! Take to the court and shoot some hoops with an AFL Basketball. 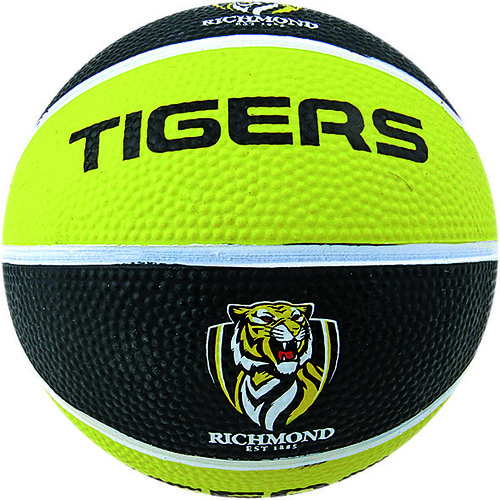 Great for the sports mad Tigers fan, this size 5 Richmond Tigers Basketball allows fans to show their support for the club while playing another popular sport. Club logos and colours adorn the AFL Basketball, guaranteeing some great banter on the court! Kids and adults alike will love dribbling and slam dunking their Tigers AFL Basketball. Products arrived super quick as always! I have pumped the 2 basketballs up today ready to wrap for Christmas. I can’t wait to see the boys faces when they see their tigers basketballs! They look fantastic! This tigers basket ball has had an amazing affect on my heart kid 7 year old grandson. He is out playing with it as soon as he comes home from school. He hasn't always wanted to play. It is wonderful to see. Thank you.